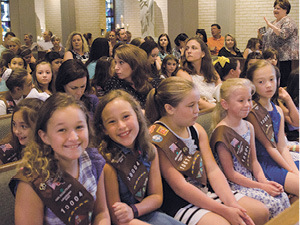 The pews of Our Lady of Mercy Church in Baton Rouge were filled with girls and boys wearing scout uniforms and award sashes for the diocese’s Religious Award Ceremony on Aug. 27. The event opened with a procession of the Knights of Columbus followed by a color guard featuring a scout from each division and the bishop. Girl Scouts gather at Our Lady of Mercy for the award ceremony. Ben Garner carries a flag in the color guard. 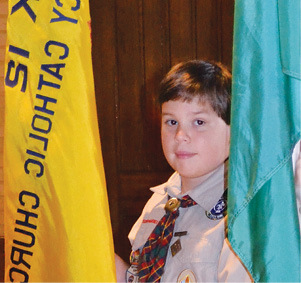 Aiden Martin, a Boy Scout with Troop 66 in New Roads, carried the Boy Scout flag for the color guard. The 12-year-old was the only Boy Scout recipient of the Our Lady’s Award, which took several months of activities to achieve. Before the awards were handed out, the bishop blessed them with holy water. Works of charity ranged from collecting and sorting canned goods for the Baton Rouge Food Bank to hosting rosaries at an assisted living facility to writing Christmas cards to sick children at Our Lady of the Lake Hospital. One hundred fifteen scouts earned religious emblems including Family of God, I Live my Faith, the Light of Christ and Parvuli Dei. Chloe Ann Landry and Bishop Robert W. Muench at the awards ceremony reception. Camille Fremin, 6, and Sedona Mitchell, 7, of Brownie Troop 10233 in Baton Rouge won the God is Love emblem for picking up litter. “It was Monday, like, after Easter, there was an Easter egg hunt on the trail we went to and there was like egg things spread around and so we picked it up,” said Mitchell. “And, we found a dead possum,” added Fremin. 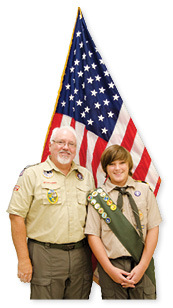 Religious emblem counselor, Louis Hebert and Boy Scout Aiden Martin. 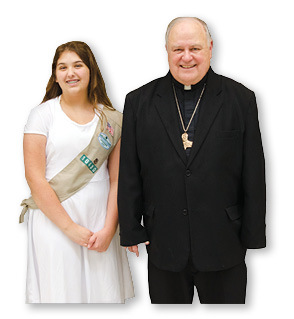 “I’m very proud of myself,” said 12-year-old Girl Scout Chloe Ann Landry of Troop 10430 of Pointe Coupee Civil Parish who achieved the Our Lady’s Award. 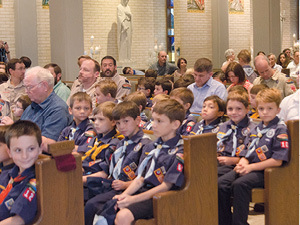 “Duty to God is an important part of scouting and this is a way a way for us to encourage and foster the practice of faith and doing our duty to God not only in our churches but in our homes, communities and in our scout troops,” said Louis Herbert, a scouting religious emblem counselor for the diocese.